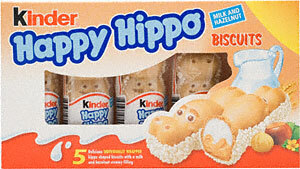 The biscuits are of Hippo shape and consists of wafer shell with fillings like chocolate ,milk , hazelnut . Each Hippo weighed in at 20.7g and came wrapped in a cellophane wrapper. Creative designs can be popular and can be used to distinguish brands from competitors .